What are predominant challenges when it comes to rivers, planning cities? For the people in the Kosi-Kamala floodplains, located in the foothills of the Nepali Himalaya, life is centred on the river and the wetlands for agriculture and fishery. While the agriculture is mostly rain-fed in summer, it is irrigated by groundwater and by water pumped from the wetlands in winter. The Kosi region has historically been very flat, lower in elevation – a floodplain landscape. However, flood control measures altered it, cutting off small river channels that used to meet the rivers Kosi and Kamala. On the other hand, the wetlands located outside the embankments don’t get enough water from the Kosi and the Kamala. The communities living around them have borne the brunt of these measures. These embankments were raised in the 1960s, and since then the Kosi floodplain has undergone irreversible changes. More recently, annual floods around the Kosi – especially in the Darbhanga district of north Bihar – have become more and more irregular, and the once-perennial wetlands have been drying up. These wetlands are among the few remaining areas in the country where endemic freshwater fish species still survive, a source of livelihood for fishers. They also provide food and shelter for migratory birds for some parts of the year. In the lean season, farmers withdraw water from it for their crops, even as it helps buffer flash-floods. But for all of its importance, the wetlands have only shrunk. In fact, the Kosi-Kamala river embankments, and the consequent erratic flood outsides Kosi, have forced the traditional Banpar fishermen to adopt unsustainable fishing practices such as upachha – the practice of draining water out of the wetlands – using portable pump-sets. This devastates both the fish and the wetlands themselves, which in turn affects other fishing communities in the area. The time at which the fishers drain the water in the shallow wetland areas coincides with the time the fish breed and lay their eggs. If the embankments hadn’t been so damaging, the Banpar’s new fishing practices would have been grimly ironical. These fishers are known to possess sound knowledge of fish in the area and their ecology, migratory routes and breeding cycles. They have used this knowledge to time their fishing activities, and to weave specialised fishing nets and traps for different species. My father is a fisherman from the same community. For my PhD, I visited some of the wetlands in north Bihar to speak to members of the Banpar community there. I asked them what they thought about draining the wetlands and how it might affect the fish. But it was not always like this. It started with the embankments. 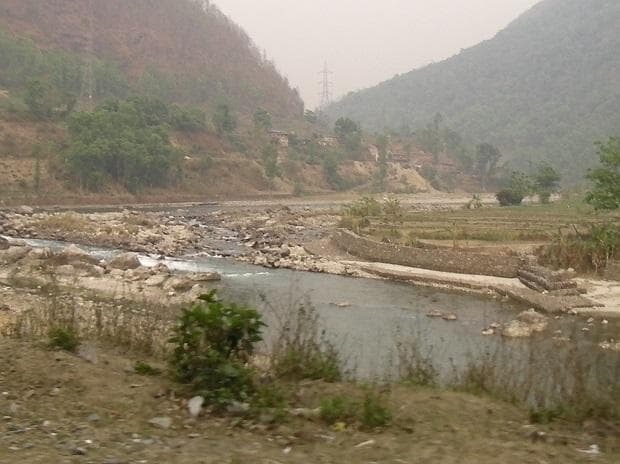 Now, the entire course of the river Kamala, all the way from Nepal in the north to Bithan in Khagaria district, is encircled with embankments. The government argues that we are now protected from floods, but as fishermen and farmers, we know we are at a loss due to this so-called ‘protection’. The flood brings both resources and risk. And we need the annual flood to replenish our wetlands for both fishing and farming. Thereafter, they began to get very vocal. Once the monsoon arrives, fish migrate far and wide with the fast-spreading water because most of the fish would have been moving upstream in the early monsoon. This is how the flood helps spread the fish into different rivers and wetlands. But now, fish are not migrating, and the fish stock is not being rejuvenated, from the Ganga to the Kosi-Kamala and into our wetlands because all the important links between the small rivers and the wetlands with the Kosi-Kamla are lost due to embankments. When I was young, I used to fish with my father in the Kosi, Kamala and Kareh rivers. The practice we followed then was that for at least four weeks in the early monsoon, when the fish migrated upward for breeding and laying eggs, we would not fish. This norm was wise because it helped sustain fish species populations. He grew angrier as he spoke. It was becoming clearer why. His and his community’s traditional practices had been rendered moot by short-sighted thinking on the government’s part as well as a sort of cultural decline. He also accused the younger fishers of “fishing only for fun”. “They buy cheap gill nets and put it anywhere they like and do not even bother to take the fish out from these nets; they simply waste the fishes.” He also alleged that they had begun using insecticides to kill fish. “These poisons don’t just kill the fish species but also affect all other aquatic species, like crabs, insects, birds and turtles, too,” he said. He said that it would be useful to acknowledge that the annual floods have become unpredictable. As a result, the water levels remain low even at the height of the summer monsoon. “The embankments built over the Kosi and the Kamala, and the sluice gates at the meeting points of small rivers, are all filled with sand” don’t work. According to him, even if the gates are opened, they won’t work because the Kosi and the Kamala “are flowing at a higher elevation than the smaller rivers” – further proof of the havoc the embankments have wreaked. Instead, had there been water in the wetlands throughout the year, the fishers said wouldn’t have had to resort to draining the shallower areas. They said they would continue even if threatened with arrest. Without fishing, they said their families would starve to death. Fishing is all they know, and they had been doing it well for multiple generations. It isn’t feasible now because of the government’s short-sighted assessment of risks due to flooding. Embankments have long been the engineering solution to flooding in Bihar. They had only one objective: eliminate floods. But in so doing, the engineers who conceived of them excluded the lives and livelihoods of the people living near them. The younger members of the Banpar are also losing what incentives they had to learn and sustain their community’s traditional methods. This doesn’t just mean the decline of a certain kind of culture but also spells ruin for the wetlands themselves – which the Banpar have been maintaining in the course of their livelihoods for many decades. With growing signs that climate change is disrupting the monsoons as well, it’s possible that areas around the Kosi will stop flooding in the near future. But more flooding is what the Banpar fishers desperately need. Without it, either they migrate away from the area or stay and wilt with the wetlands. The story of the Kosi-Kamala floodplains demonstrates the importance of designing and managing our infrastructure in a way that recognises floodplains as complex and intricate social-ecological systems. Ranjeet Kumar Sahani is a PhD student at the Ashoka Trust for Research in Ecology and the Environment, Bengaluru.